Celebrate the Lunar New Year with the 12th Annual Vietnamese Spring Festival and Parade this Sunday downtown San Jose. The festival includes arts and crafts, live music, cultural performances, games for the kids, and authentic Asian cuisine. The parade includes decorated floats, dragon and lion dancers, multiple musical bands, etc. Be aware that there will be traffic problems due to the large number of people attending and the street closures due to the parade; get there early! Ride VTA Light Rail or VTA Bus Lines 22, 23, 63, 64, 66, 68, 72, 73, 81, 82, 180, Hwy. 17 Express and MST 55 to the celebration. VTA Website. Caltrain will be doing routine maintenance on its train tracks from South San Francisco down through the South Bay this week. Monday through Friday crews will be doing various tasks along the tracks between Atherton and San Jose. The work will take place from 10:00 pm to 7:00 am when the rains are not running. There may be delays in these areas along with some construction noise. Friday evening at 8:00 pm the railroad grade crossing at Rengstorff Avenue in Mountain View, between the Central Expressway and California Street, will be closed to allow crews to reconstruct the crossing and adjacent track, as well as resurface the street. The temporary closure will take place until Monday morning (March 31) when the track will be reopened for regular weekday train service. Drivers will have to detour around the construction by using Shoreline Boulevard or the San Antonio Road overpass. A free shuttle will be available for pedestrians on Saturday and Sunday from 9:00 am to 5:00 pm. Moffett Field has changed a lot over the years. When I was a kid, we used to go to the base to shop at the Navy Exchange and get groceries at the commissary. 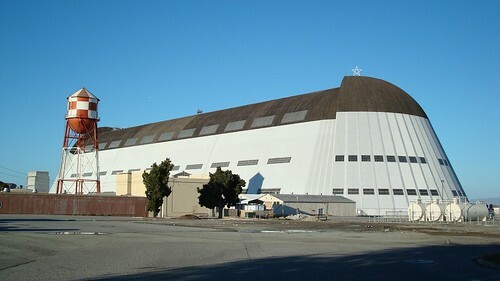 Later in life, I worked at NASA Ames Research Center, as did my mom. The last remnants of the old Navy base are coming to end. While the Exchange and the commissary are still there, the Exchange will be shutting down in February, and the commissary will be open indefinitely. Most of the base that I remember has changed… it’s more like a semi ghost-town. Not too long ago I shared a little story about Grandpa. 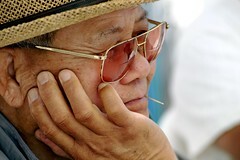 On June 2, 2007, the person responsible for bringing grandpa into our lives died at the age of 82. His name is Osias Baltazar Coching. He leaves behind his wife, 4 adult children and 5 grandchildren, and an enormous extended family scattered around the world. Always a sage of advice and gracious generosity, he also leaves behind several lifetimes of advice and excellent karma with everyone that knew him. He was put to rest June 8 in Los Gatos Memorial Park, just a few feet away from Grandpa. Our first MetroBlogging Holiday together-How sweet it is. KUBO-pick up some Belgian chocolates, a lovely orchid and a candle.